A PPL is a Private Pilot Licence that will allow you to fly a helicopter you are rated on, with passengers but for private use only. A PPL licence will not allow you to be remunerated in any way for flying and is purely for private use. 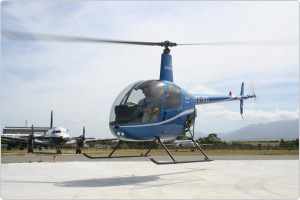 Our Private Pilot course is designed to achieve a real world level of training that will allow you to achieve the SACAA Helicopter Private Pilot certificate. This can be your first step toward the commercial pilot program or can be designed to meet your needs for personal enjoyment or as the future owner of a helicopter. Hold a valid Class 1 or Class 2 Medical certificate. Hold a Restricted or General Radio Licence. Have completed the required practical and theoretical training syllabus. Have flown at least 50 hours in helicopters comprising at least 35 hours dual instruction and 15 hours solo of which 5 are solo cross country. Have passed the eight PPL theoretical exams. Have passed the Practical Skills Test.